FreudBot is rated 2.2 out of 5 by 12. Rated 5 out of 5 by Seji from Loved it! If you've ever played D&D, Magic the Gathering or Hearthstone, then you'll understand the concept of this game. It's a CARD game! You play against an opponent that the game selects for you. It could be your boss, your girlfriend, etc, that fits in the storyline. 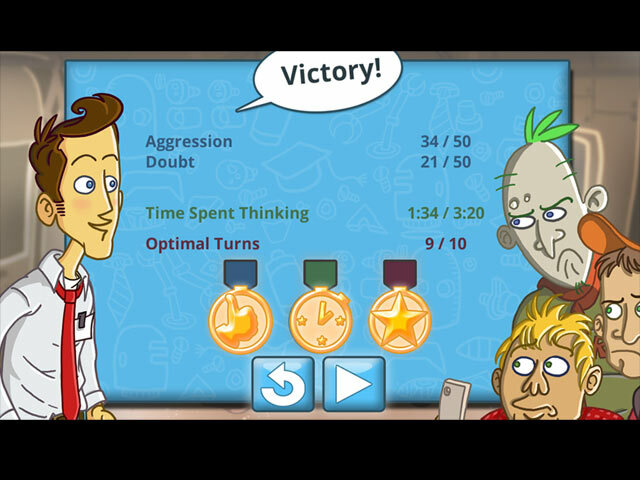 You have to keep your aggression and doubt, shown in meters, in check in order to win the hand. You do this by countering the cards that they play with cards of your own. It's simple, it's fun! The instructions are clear, the game has a good tutorial and it's easy to understand and play. I recommend this game and I rarely do that! Rated 4 out of 5 by pattiaz from Easy game I thought this game was quite easy. I have seen other reviews and thought that I would add another because I didn't feel that it was difficult or boring. Rated 4 out of 5 by CameoLove from i liked it It wasn't the most challenging or thought provoking game but it was a card game and there are so few board/card games that are not high-low solitaire games. So on that note I was glad to just have something new. Rated 2 out of 5 by LittleLadyBambi from Confusing I have no idea how this is played. When I thought I figured it out, I didn't and there is no true tutorial..... confusing as a game could get. Interesting concept though, I'll give credit there. Rated 2 out of 5 by karema from its math! i played for 20 minutes. 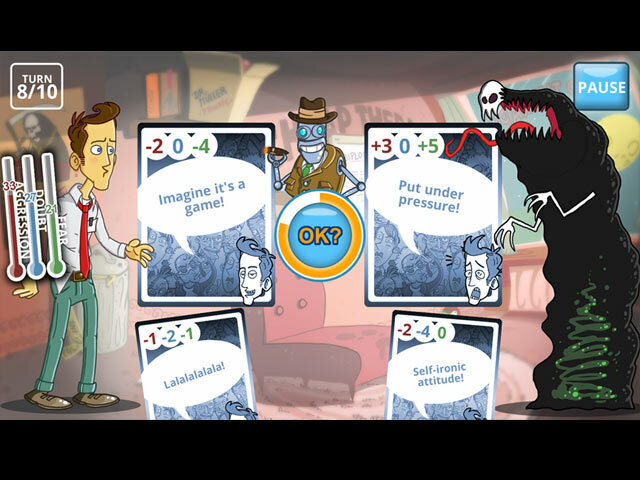 the game play consists of conversations between the main character and a freudian robot who is trying to cure the characters anxiety. sounds better than it is. all i did during the trial was subtraction problems. the main character faces different people who make him nervous. they have cards with thing like "bad odor" +4-0. you have to select a counter card, ie "air freshener" -4+1. the cards are subtracted from each other and you get the left over points. when you get to 50 points you have a nervous breakdown. 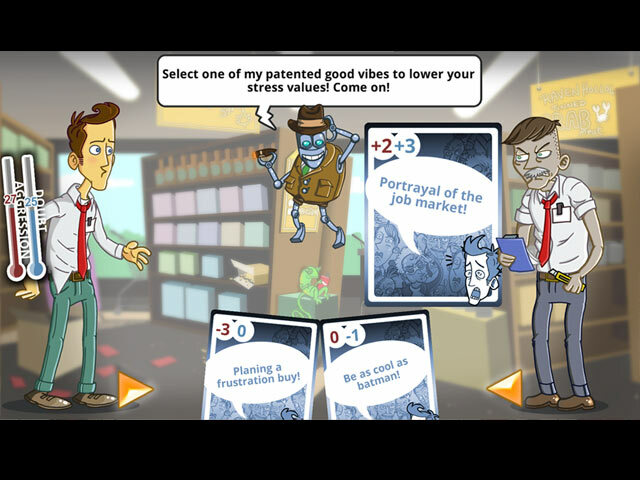 some of the cards are funny, but the game is very repetitive, the characters change but the game play doesn't. i don't care for math so doing problems over and over just isn't for me. it would be a good activity for an elementary school children to use to improve their math skills. i don't recommend it unless you love math, corny jokes and even cornier psychology. Rated 2 out of 5 by xansaunt from Not very engaging Quickly got boring and was not engaging. I didn't finish trial time, and have deleted it. Rated 2 out of 5 by PinkCherry from I don't get the point. This is a card game with a relationship theme. FreudBot is a Great Gazoo like character that gives emotion control advise. Really all there is to do here is add up numbers on cards and choose the card with the highest value. I did not make it to the end of the demo because I was starting to nod off. Rated 1 out of 5 by krole91 from Useless Can't tell if this was really boring, or if I missed the big secret - made it only 15 minutes before deleting. Rated 1 out of 5 by Aus_girl from BFG, what were you thinking? What a terrible game! It sounded like it might be worth trying because it was something different, but it wasn't. I didn't even last five minutes. When I downloaded the trial, there were no reviews posted, so I had no idea just how bad this was. I can't believe this got onto the Big Fish game site. Even when games have not been to my taste, the quality has always there. Not this time. Seriously, I wasn't glad that Freudbot was there! The only thing I liked about the game was hitting the uninstall button. Rated 1 out of 5 by pennmom36 from Pointless Game I don't often rate games with 1 star because most games have some type of entertainment value, this game however, seems so pointless and definitely isn't fun. 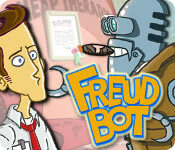 Seems Steve has trouble dealing with stress in a positive way, so his insurance has sent FreudBot to the rescue, a Robotionic Psychoanalyst. Basically, Steve must confront stressful situations, and learn to control his Aggressions, Doubts and Fears, one card at a time. Steve's opponent will present him with a situation card that Steve (aka you) must counteract with an appropriate response card. Each card has a value which either adds or subtracts points that either raise or lower Steve's Aggression, Fear and Doubts, 50 points on any of those will make you lose that level. Thats it in a nutshell, I see no point to the game, most people will chose cards to win the level, not read the card and apply that morality to every day real stress.